Use it to cover home renovations or other expenses, all while enjoying a fantastic rate. Applying for this loan is completely free. Get started by calling one of our trusted loan officers at 570-342-2720. A home equity loan can be used for any expense, including home repairs, emergencies, celebrations and vacations. This type of loan comes with a big advantage: the rate is low and fixed, secured by the value that's already in your home. Interested in maximum flexibility? We also offer a Home Equity Line of Credit (HELOC). This option is a revolving line of credit, where you only pay interest on what you actually borrow. "My recent Home Equity Loan process was very efficient and straight forward. The loan officer was very knowledgeable and made the process easy and timely for me. Thank you very much for the great service." mortgage balance is applicable. Primary PA residences only. Full details are available at the credit union. APR=Annual Percentage Rate. Rates and terms vary based on creditworthiness. All rates are subject to change without notice. 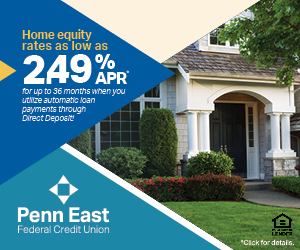 Maximum Home Equity loan or line of credit is 80% appraised value less current mortgage, if applicable, primary Pennsylvania residences only, for LTV over 80% please contact the credit union. All loans must be paid through ACH/payroll receive this promotional rate.